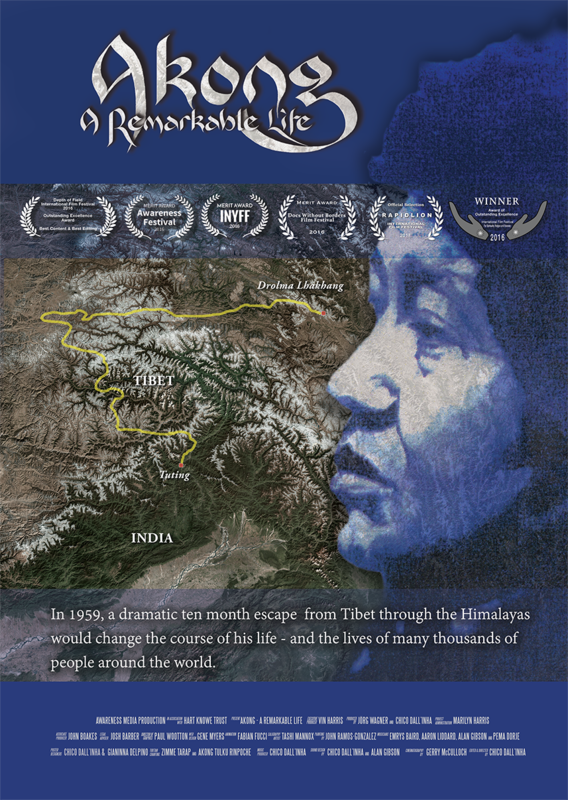 The feature length film documentary that captures the fascinating, inspiring and tireless life of Akong Tulku Rinpoche: teacher, spiritual leader and doctor of Tibetan medicine. This is the first ever documentary film about the inspirational life of Chöje Akong Tulku Rinpoche. Through his powerful message of loving-kindness and compassion and his humanitarian work around the world, Akong Rinpoche has benefitted the lives of countless people. This film aims to make his inspirational life story available to future generations. Akong Tulku Rinpoche, born in Kham in Eastern Tibet in 1941, was quickly recognized as a reincarnate Tulku and enthroned as the Abbot of Drolma Lhakhang Monastery at the age of four. In 1959, tensions between China and Tibet reached breaking point and Akong was forced to undertake a dangerous journey across the Himalayas on foot to India aged nineteen. From the party of over two hundred Tibetans that set off, only fifteen survived the gruelling ten-month ordeal. When they reached their destination, living conditions in Buxadaur refugee camp in Assam were extremely poor. The hot climate combined with the lack of food and medicine claimed the lives of many of the surviving refugees, including Akong's elder brother, Jamyang Chogyal. In 1963, Akong arrived in the UK with Chogyam Trungpa Rinpoche. In order to support themselves, Akong initially worked as an orderly at a hospital in Oxford. In 1967, he founded the first Tibetan Buddhist monastery in the West - Kagyu Samye Ling in Scotland. Samye Ling has become an international centre for authentic Tibetan Buddhist teachings, renowned for bringing great contemporary Buddhist masters such as HH the 16th Karmapa, Dilgo Khyentse Rinpoche, Kalu Rinpoche, Tai Situ, Ringu Tulku amongst others. Akong Tulku Rinpoche continued to personally supervise his countless projects, right up until death at 73 years of age. His projects reach out to thousands of people in need through his charity ROKPA International, which invests nearly 100% of donations directly into humanitarian projects in Tibet, Nepal, India and Africa. Please visit our Facebook page, Akong: A Remarkable Life. There you will find a list of upcoming and past screenings in the UK and around the world, and other news. By liking the page, you'll receive daily updates. "The real challenge is to have balance and stability within continuous change." "We can become free if we deepen our understanding of the mind." "The mind can be compared to a wild Tiger, rampaging through our daily lives. " Filmmaker and producer of documentaries and promotional films for art, charity and non-governmental organisations. Jörg currently lectures on Imaging Practice and Production at University of Westminster as well as film and media studies at London College of the Contemporary Arts. Chico Dall’Inha is a Film Director, Producer and Editor. His credits range from drama and documentary, to broadcast and corporate videos. Chico runs Awareness Media Productions and creates films for commerce, the arts, and humanities. Chico also lectures on Filmmaking at Goldsmiths, University of London. Gerry McCulloch is a photographer, cinematographer and lecturer with many broadcast and exhibitions credits in film, documentary, and promotional videos. He operates Darshana Photo Art and was previously a director of Untold Productions. Gerry devised and leads the MA in Filmmaking and two undergraduates Film courses at Goldsmiths, University of London. "I watched the film last night, and I am literally still feeling the impact this morning. What a beautiful, meaningful, inspiring gift you have created." ""Congratulations to you and everyone involved! You've made a beautiful and important film." "This film changed my life. I was lucky enough to know this amazingly compassionate being when living at Samyeling in the 70's and then I saw this film whilst doing a retreat at Samye Ling this summer. A must see film." If you are a member of the media and would like to feature a story about this film, please contact us via the Feedback tab on the left edge of the screen. Images used on this page are originals created by various people, and consent must be obtained prior to usage to confirm their availability.